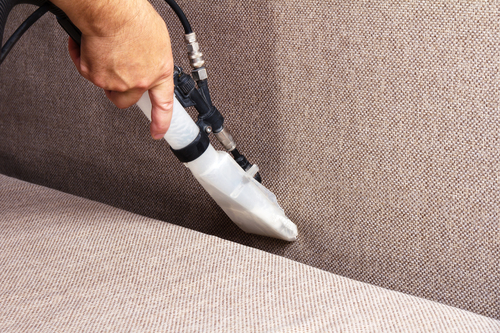 Your upholstery probably hasn't been cleaned in a decade. Think about it. You sit on your couch, deposit lint, dirt and of course coins into the cushions, then simply get up and walk away. Once in a blue moon, you decide to scavenge for those long lost quarters, only to find that there's a rotted old piece of chicken stuck in the innards of the upholstery. Your Upholstery collects so much dust and dirt over time, that it can be very bad for you or your family's allergies. All the pet dander that is buried within the couch cushions is breathed in daily, causing sniffles, sneezes and red eyes. We know from experience. Before we started our Carpet Cleaning Company in Arvada, we hadn't cleaned our own Upholstery in years, maybe ever! We suffered from allergies, and thought that it was simply from the changing of seasons from winter to spring to summer. When we did our research, we realized that we couldn't be more wrong. We immediately changed our habits to Cleaning our Upholstery twice every year, and we recommend the same to every person we meet. How many pieces of furniture are in your home that are covered with Upholstery? The normal amount per household is 4, including Couches, Love Seats, Recliners, and Chairs. There is only so much you can do to Clean your own Upholstery in your home. Sure, you can vacuum it and pick up all the small pieces of dirt that you can get to, but there is virtually no way you can give your Upholstery the deep Cleaning that it needs to get rid of those invisible bacteria. Arvada Carpet Cleaners will give you a free quote on your Upholstery Cleaning. Just let us know how many pieces of furniture you have, and we can instantly let you know a price and the amount of time it will generally take to freshly Clean your Upholstery. With a fresh Upholstery Cleaning, your couch, chair or love seat will not only look and smell brand new, it will revitalize the piece of furniture, making it last a few years more. Would you rather buy a brand new Lazy Boy, or make yours last a few years longer? Yup, we thought so.